Believe it or not, there is the odd downside to summer. You see, it's like this. When the sun arrives earlier and earlier each morning and hangs around, while dancing over our pond, until it's way past my bedtime, my chief cook and bottle washer heads for the hills and leaves me stranded. And I become a lawn tractor widow. LOL, Andrea! I am glad to see he's wearing ear protection. When I worked in a hog confinement system for the Univ of KY, I used to wear the same thing when I'd feed in the barn in the mornings - hungry, squealing sows and boars in a cement building - well, you get my drift. I'm glad I no longer work there, just couldn't take raising hogs in that environment any longer - it damaged my soul. Take care, and glad you're learning about fireflies vs lightnin' bugs - which, by the way, I saw some outside my sliding glass door this evening. The cats went wild! Hope you have a good Wednesday, since it's already 11:42pm here in KY on Tues night. Bye now, from KY. So true...mowing and trimming every day to try and stay ahead. Today's plan is to till the garden before more storms come...ahhh, those weeds love rain! Before we know it the dog days of summer will be here...dry and hot, we just may miss these greener days of spring! "Lawn Tractor Widow"......BWAHAHAHAHAHA! That is really cute. I have been there my friend. Wow, my hubby wants a lawn tractor and I thought the horse was bad! I am a "lawn tractor widow" too! CH washes and waxes the lawn tractor. SHHhhhh, don't tell anyone. He thinks it's a yellow 'drop top' sports car. 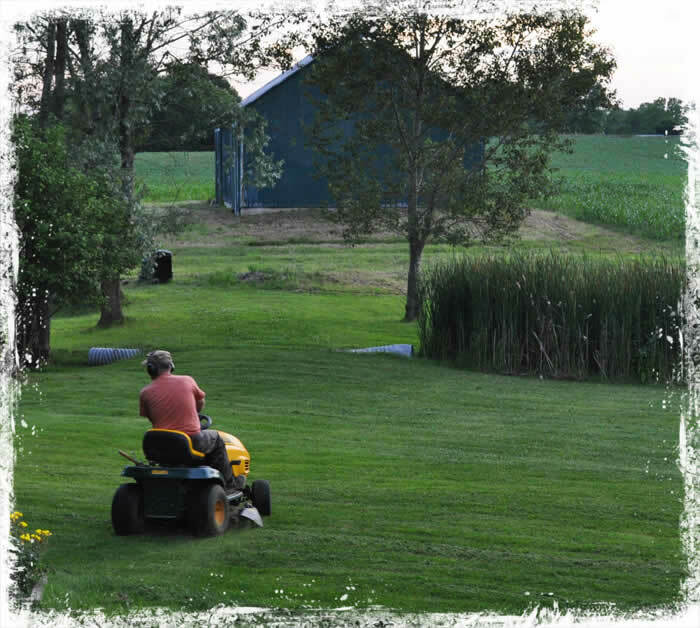 Doesn't get any better in fall cause he uses it to haul around the supersucker for the leaves :) Beautiful picture and don't ya just love a brand new spankin mowed lawn/field?! We tractor widows have to stick together. And our revenge is BLOGGING!